When it comes to major financial goals, two of the biggest are paying off debt and building an emergency fund. Both are smart money moves. But how do you prioritize them? Should you just tackle them one at a time? Or can you successfully reach both goals at the same time? Paying off debt – even if you’re currently making the monthly payments with no stress – can help put you in a better money picture and even in a better state of mind. Of course, paying off debt can help free up extra money in your budget. That extra money can help you reach other goals faster or help you save more quickly. Plus, paying off debt can help you eliminate higher-interest payments on that debt. Wouldn’t you rather spend the money you’re paying on interest each month on something more important? As a result, paying off debt can mean good things to your budget in multiple ways. What if your car suddenly needs major repairs? How will you pay your portion of the medical bills if you’re hurt in an accident? Where would you get the money to get by if you lost your job? They’re all perfect examples of why you need an emergency fund. If you’re self-employed, have a family with kids, or rely on just one income to make ends meet, consider an emergency fund closer to the nine months’ of expenses mark. If you’re retired with a pension or have made a habit of living well below your income, a smaller emergency cushion might be okay. Decisions, Decisions: How Do You Choose A Game Plan? The answer is different for everyone. If your debt is weighing on you, then paying it down might be your top priority. 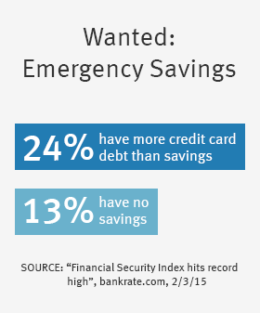 Perhaps you’re worried how you’d keep afloat if you ran into a financial emergency. Then building an emergency fund may be the right financial move. But do you really have to choose one goal over the other? Not necessarily. At Discover, we understand that you might want to tackle both goals at the same time instead of focusing on just one area while you leave the other goal untouched. 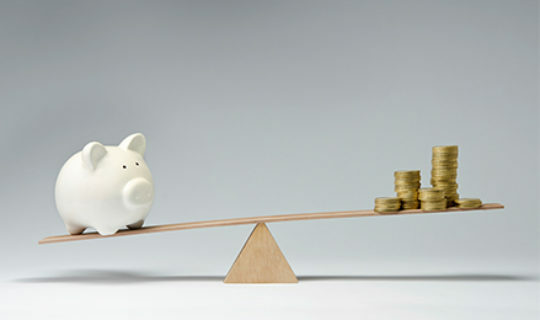 In essence, it’s a bit like the proverbial “killing two birds with one stone.” By paying down higher-interest debt with a personal loan, you could save significant money in interest payments and even have the potential to lower your monthly payments. At the same time, you could use some of the money you’re saving to start building an emergency fund. Pay down up to $35,000 in higher-interest debt with a Discover Personal Loan. You can choose how quickly to pay off the loan based on your budget and financial goals. Then, use the money you would have paid in higher interest to fund your emergency savings. Even saving as little as $50 or $100 a month can put you on a better path for financial security. Plus, once your Discover Personal Loan is paid off, you can kick up your saving to an even higher level so you’ll build the emergency fund you want even more quickly. You don’t need to choose between paying off debt and building an emergency fund. Taking advantage of a Discover Personal Loan can be a smart way to help you successfully reach both goals at the same time.